Death Valley Temperature Changes | What Planet Is This? Years ago (before 2003 and after 1998), I became interested in desert temperatures (specifically Death Valley). One of the predictions of greenhouse theory is that dry regions, like deserts and polar regions, will show the effects of CO2 warming more than other areas. This is because CO2 effects are masked by water vapor, so dry regions are the “canary in the mine” signal of GW. 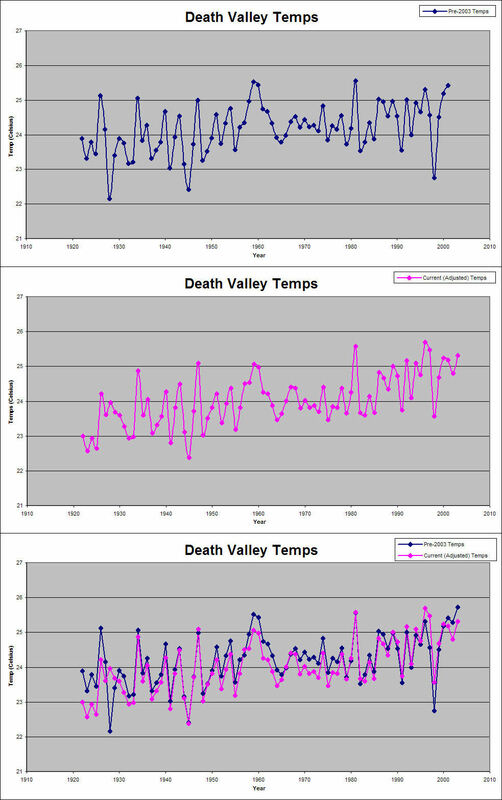 Unfortunately (for AGW), during the hot year of 1998, Death Valley had a cold year–third coldest in fact. 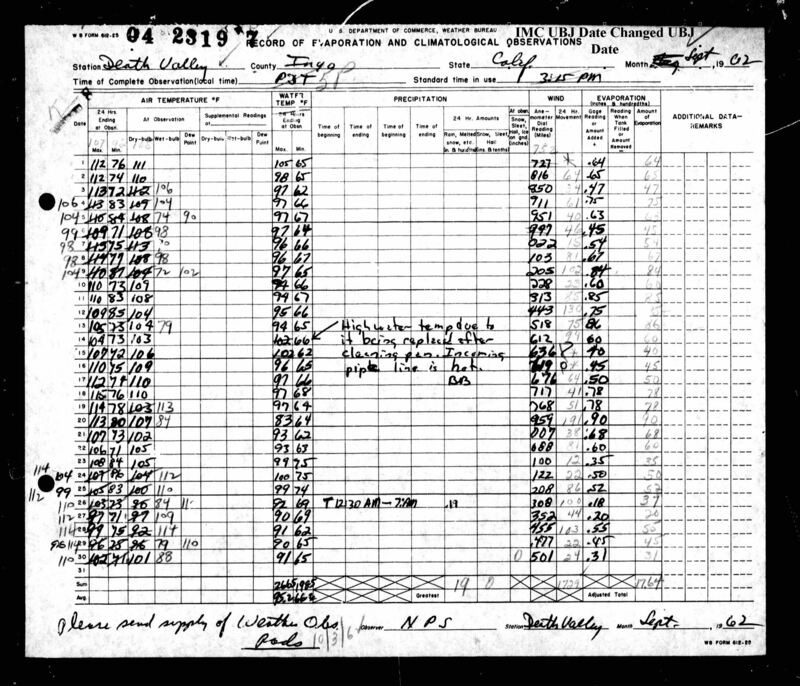 I stored my data away and didn’t check Death Valley temperatures until recently. The current data show that 1998 is still a cool year, but something has changed. The temperatures now shown for Death Valley weren’t as I remembered them. So I pulled out my old data and checked. Below is a comparison of these datasets. The first graph is the pre-2003 plot of my saved data. The second plot is the current GISTEMP values. In the third plot, I overlay the two datasets. Apparently Hansen’s been busy “correcting” these temperature values during the last few years. The linear trend slope of the pre-2003 data is 0.0143 °C/year and the current data has a linear trend slope of 0.0192 °C/year. Have fun trying to figure out the temperature modification algorithm. I tried to check the original B91 forms and that’s a lot of work. Too bad there isn’t a fancy OCR program that will scan these forms. The two years that I checked don’t match either dataset. An OCR of THIS form would be nearly impossible. It’s easier to hand-enter the data than to babysit an OCR scan.